No, not that urge, I mean the urge to make sense out of tempus fugiting. Here we are on the last day of the year and of the decade, so naturally there's that urge to recap and reassess the most important events, deaths, accomplishments, weather and meals. I am not so foolish that I would make a stab at any of that stuff as it's far beyond my power to approach. 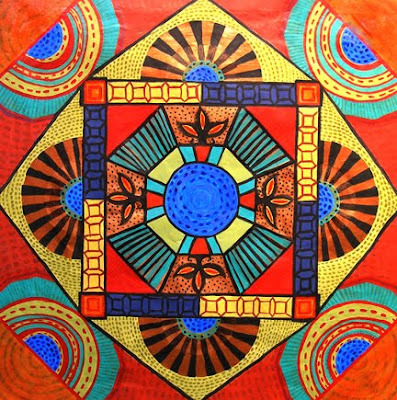 An old painting of the Four Elements, when the world was younger and more symmetrically ordered. Yes, I did think about it and what got me started on this was, of course, all the stories on TV, online and in the newspapers. Particularly, an item in today's New York Times was pretty fascinating. 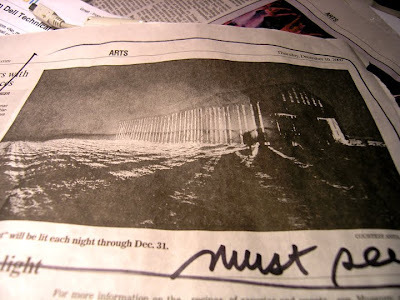 Called "Documenting the Decade", it's a series of photos sent in by Times readers and arranged by year during the '00s. They are beautiful, horrific and moving photos that are well worth a look. The '00s was plainly a really bad decade. Some people are calling it the Decade From Hell. First off, it should be obvious that any decade that begins with the Supremes having to decide who won the 2000 presidential election does not look to have a good conclusion. I remember how dazed and numb I felt when waiting for the outcome to finally be settled, as in: this bad movie can't be happening in our country. But when they awarded the presidency to Georgie Boy, I had no idea of the horrendous developments and excruciating emotions to follow. So here's where the list of events, deaths, etc. should appear. 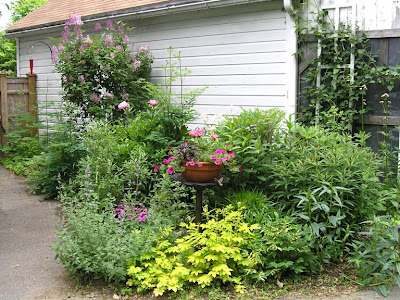 Instead, I'm going to post some pictures of my garden taken this past June when all was just lovely, not too overgrown, not bug eaten, not too wet or too dry and I thought it would stay that way forever - just like I thought all was well as we hit the new millenium before the world fell apart. 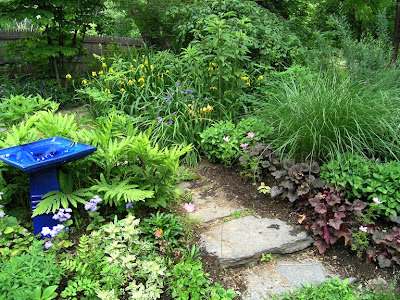 A new blue birdbath and a stone path toward an overgrown fish pond. 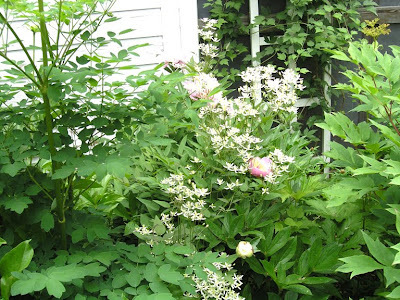 Clematis blooming among the peonies and meadow rue - a happier time of year. A planting at its peak this early summer by the garden path. The boys looking very serious and wondering what comes next. 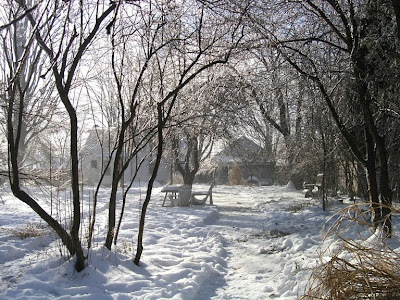 As you contemplate the garden, I hope you will breathe deeply, contemplate the eternal, and feel the power of a wonderful new year enveloping you under the light of the blue moon as Elvis croons that tune in your mind's ear. 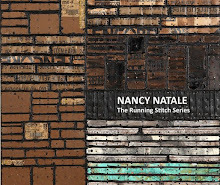 This is Nancy's blog talking. I turned on the computer after she fell asleep watching Letterman - as usual. 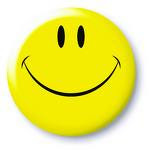 I just wanted to let you know that this is my 100th appearance on Blogger. Yup, I've been here 100 times - 97 posts in 2009 and 3 in 2008. That was after she remembered that she had actually set me up in 2006 but never published me. I don't know how she finally remembered, a mere two years later. Anyway, it's nice to be out in public and I know she has big plans for the new year. 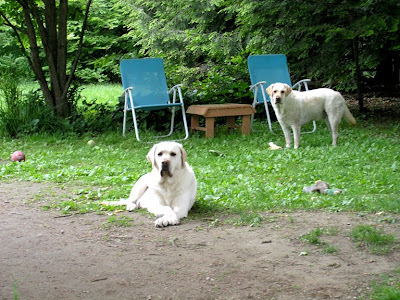 Lots of posts about artists, new work, shows, teaching encaustic classes, more of those dull photos of the backyard that she takes incessantly, those dogs, etc., etc. and, oh, yes, the studio. I'm sure she'll have plenty to say about that and maybe she'll even be making art in it. So stay tuned. Much more to come and maybe I'll make it to 200 in 2010. Here are two new pieces that I made yesterday and today with help from the Fat Boy torch. They are both 24"x24"x1.5". I have never made work so quickly or with such a feeling of empowerment. What a rush! On the left Big Boned But Fiery and on the right Thicker Than Water. I had resisted getting a torch because I was afraid of the open flame, setting myself or the studio on fire and/or causing an explosion. But as more and more friends (especially Lynette Haggard) told me that they were using torches*, I decided that I had to take the plunge. I actually did have a torch that I had bought a while ago that was part of a plumbing kit, but to hook up the nozzle, you had to pry the lid off the container of propane and that scared the hell out of me. When Sue Katz told me that you could get a kit at Home Depot that had a hose and a self-lighting nozzle, I knew I had to do it. That's how the Fat Boy and I met and it was love at first strike. Thicker than Water at a slight angle. Closeup of the bottom of Thicker Than Water. 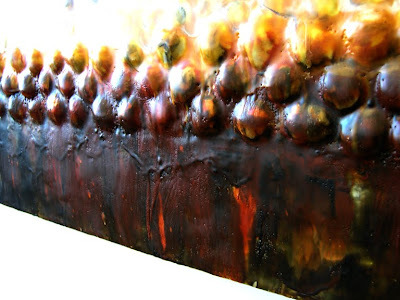 I worked this part by applying the paint with the piece flat, then hanging it on the wall to use the torch on it and then laying it flat to scrape some of the drips off. And then back and forth adding paint, torching, scraping, etc. Pretty soon I'll have arms like Michelle O. because this has a lot of wax on it and is pretty heavy. 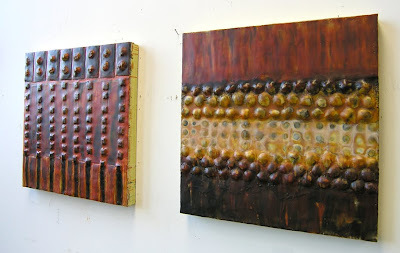 Readers of this blog with long memories may remember that I was trying to reuse two 24"x12" pieces that I had taken off another work. Below is a photo of an early stage of one of the reworks. You will note that the square panel on the left is what eventually became Thicker Than Water. I gave up on using the narrow piece with this because it just wasn't working out. My head is now in a different place and I just have to go there. The Fat Boy is leading me. Below is the second piece that I made today. I have a couple more early photos of this to show you because I had also intended to use this panel in combination with the second 24"x12". These pieces were just not working out no matter what I tried. This is Big-Boned But Fiery. Here it is in an early stage with the narrow piece beside it. Dull, dull, and nothing in common with the companion. When I went into the studio this morning, below is a photo of the way Big-Boned But Fiery (BBBF) looked. The holes that you see were where I dug out some additional inclusions that I decided were too much. Then I had to fill the holes with medium, add more paint and scrape down some to level everything off. I worked a long time to get the color right and integrate the inclusions that I left in. I love orange, but the danger for me is that it gets looking too carnivalesque, so I always have to take it down a notch or two from where I start. The final version of Big-Boned But Fiery. A word about inclusions: Yes! I like them because they set up a pattern and add dimension. 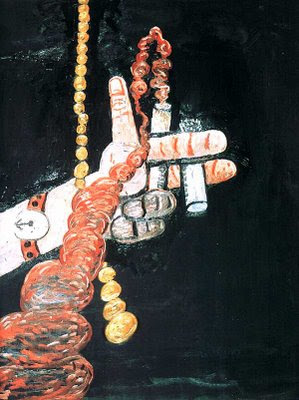 I find that I use them in a kind of ritualized way that provides an anchor for the painted surface to play off. My eye is always drawn to these organized, patterning elements when I'm looking at something. Is this an architectural or sculptural affinity? I'm not sure, but there it is. I was worried that I wouldn't be able to use a torch with the inclusions, but so far it seems fine. I can see that threads catch on fire, but it goes right out once the thread burns down (how do I know that?). I also learned that sometimes the heat gun rather than the torch is the best tool for a particular section of the painting if a slower, calmer heat is called for and this knowledge seemed pretty intuitive. All in all, my initial experience with the torch has been great. I've already started another 24"x24" that goes with these two pieces and setting it up was unbelievably fast. It's also much easier for me to use the torch instead of the gun because the gun takes so long that holding it in place irritates my bad shoulder. 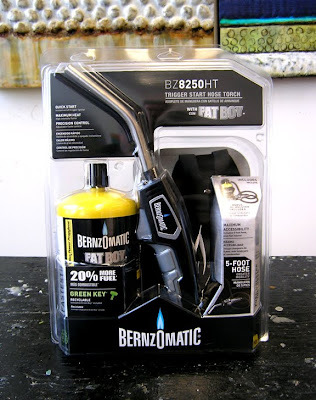 My advice to all encaustic painters is to go out, get yourself a Fat Boy and get happy. 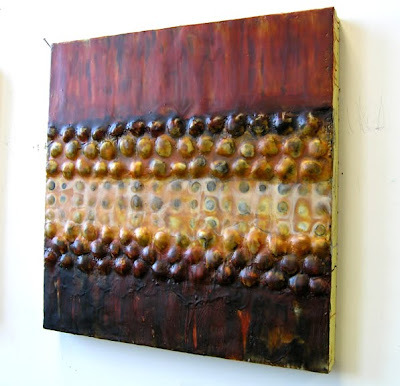 *Lynette Haggard is doing a demo at the 2010 encaustic conference on torches as she did this past year. Here he is - the new love of my life, that big-boned guy I'm crazy about! No, I haven't left my dear wife, but I just started using this wonderful Christmas present given to me by my mother-in-law, Jan. Wow, what a difference it makes! I just love the fusing speed the torch makes possible. And it's that power tool thing that empowers. I worked on a couple of pieces today and hope to have pix tomorrow. You'll see the difference in my work - and this was just the first day. I'll be making room-sized paintings before I know it. 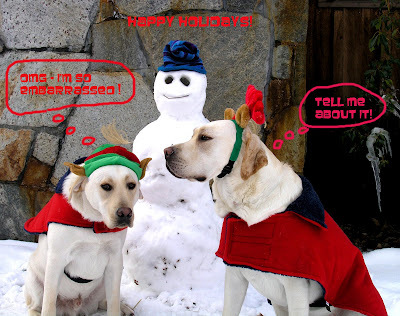 Live It Up - It's the Holidays! Just don't embarrass yourself the way some of us do. 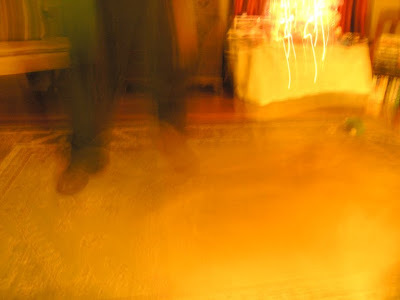 Best wishes to all for a Happy, Merry, Joyous, Restful, Peaceful, Contemplative, Memorable, etc., etc. Whatever! Rob Moore taught at Massachusetts College of Art for 26 years and made an indelible impression on those who studied with him - or even those who just passed him in the hall. He was "the kind of a teacher students love to hate - charismatic, authoritative, charming." Nearly 17 years have elapsed since Rob's death on December 31, 1992. He died at age 55 of complications from AIDS, one of many who tragically contracted the disease too soon to benefit from life-prolonging drugs in use today. Rob Moore closeup from "The Eloquent Eye", a Boston Sunday Globe article about him by Jon Garelick with photographs by Keith Jenkins, published May 22, 1988. The quote in the paragraph above is from this article. 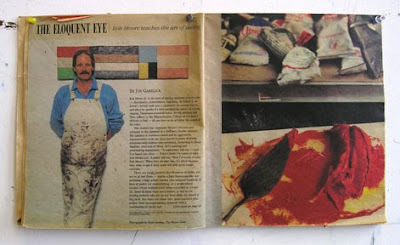 Full page spread from "The Eloquent Eye", subtitled "Rob Moore teaches the art of seeing," showing paint tubes and mixed paint on a palette in Rob's studio. Rob is standing in front of one of his paintings. That such a vibrant and dynamic person, artist and teacher as Rob should have had his life cut short is truly a great loss. He had so much to contribute with his own painting as well as through the work of his students. He died much too soon. "It's the difference between seeing and hoping to see." (Rob Moore quoted by Jon Garelick). In 1988 I graduated from Mass. 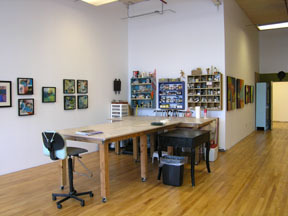 College of Art (MassArt) after having majored in painting and having studied with Rob Moore during my last year there. Studying painting with Rob was a big reach for me. Most of the time I had no idea what he was talking about. Only now, more than 20 years later, does some of what he said about painting, color, space, marks and two dimensions started to make sense to me. Recently I discovered a notebook I had kept from his color class. As I paged through it, I read verbatim statements I had taken down but not understood at the time. 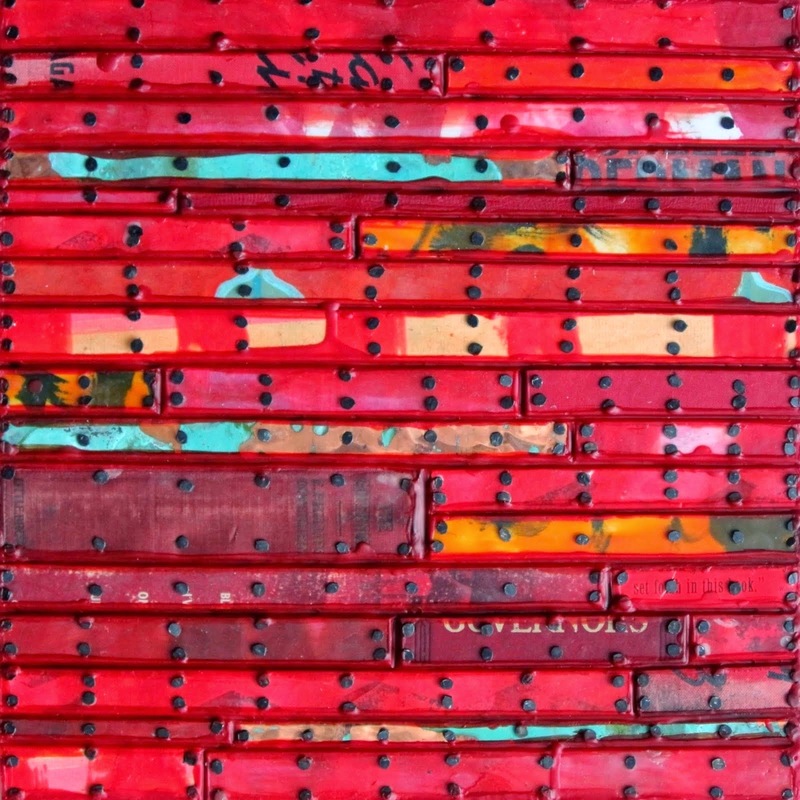 "Oh, that's what he meant," I thought more than once as, for example, I read a homework assignment to make red a relative black in six assemblages of colors. I understand that now but then I was in a quandary. 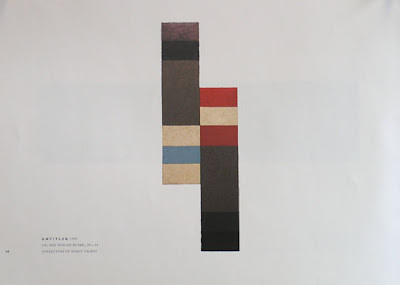 Cover of the catalog of Rob Moore's retrospective, September 8 - October 23, 1993, Huntington Gallery, Massachusetts College of Art, organized by Jeffrey Keough, Director of Exhibitions. 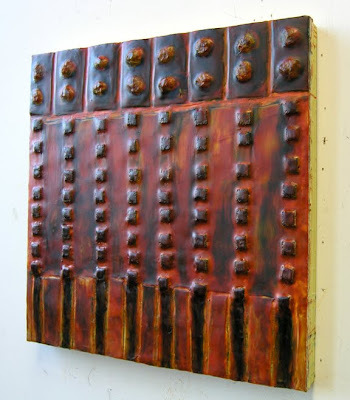 The painting pictured is Untitled, Summer 1992, oil and wax on board, 80"x18". 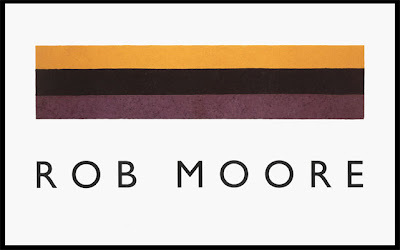 I have been wanting to write about Rob Moore because he died before the internet made accessing an artist's work and life so simple. If you Google Rob's name, very little comes up and it makes him seem invisible. Articles about him are not easy to find and are not free when you do locate them. 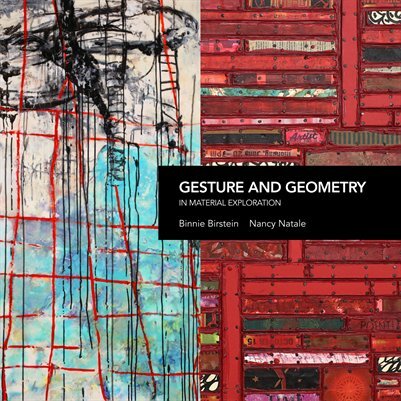 I am lucky to have the Jon Garelick article, the retrospective catalog and a review of the retrospective by Christine Temin, then the major art reviewer for the Boston Globe. She described Rob's late work as being "in a league with the likes of Mark Rothko and Barnett Newman" although made in a smaller and more intimate scale. 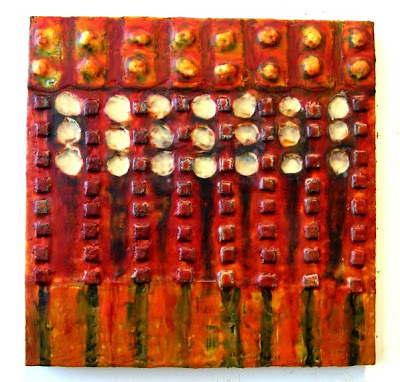 Image from the retrospective catalog, Untitled 1991, oil and wax on board, 80" x 81", collection of David Murphy. This one is my personal favorite. I feel a bit intrusive writing about him because I did not really know him that well - not on a personal level as many of his students did. 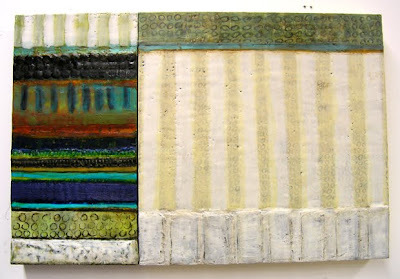 But of all the teachers I had at MassArt, he is the one who has had the greatest influence on my work over time. It's only as I have begun to mature as an artist that I realize his influence. I can't begin to recap Rob's life and work, but as I read through the slim amount of documentation about him that I have, I did find a striking connection with him that I had not registered before. Rob was one of the founders of the Graphic Workshop in Boston, along with Felice Regan and Chris Mesarch. This print cooperative was formed in response to political and social events such as the assassination of Martin Luther King, the Vietnam war, the killings at Kent State and other turbulent events of the late '60s and early '70s. The idea was to make socially responsible work that was high quality but essentially expressive of a political viewpoint. 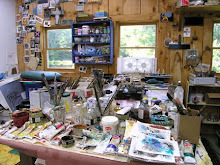 During his involvement with the Workshop, Rob stopped painting because he questioned "the seemingly selfish act of painting", according to Jon Garelick. On a trip to New York, Rob stopped in at a Jasper Johns retrospective at the Whitney where the targets, flags and maps were being shown. Rob was blown away by "the sheer involvement of the artist with his material" (Garelick) and came away with tears in his eyes. He realized that it was time for him to "make some of those private excursions" (Garelick quoting Moore) that an artist makes through painting, and this prompted him to withdraw from active participation in the Workshop so that he could begin painting again. 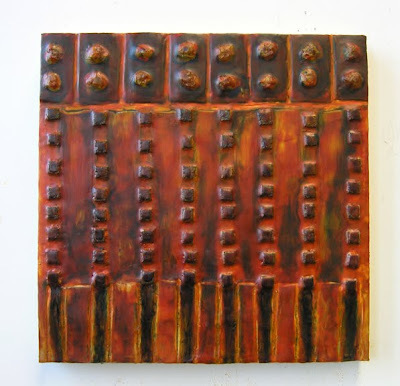 Rob painted geometric abstractions with oil paint and cold wax medium, but I wonder if he would have adopted encaustic as it became more accessible and widely used. 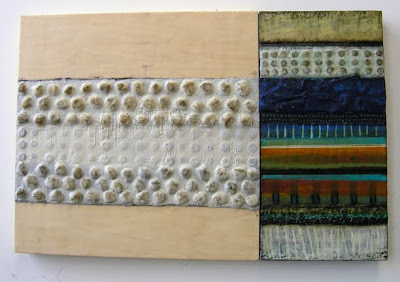 Many of the Johns works included in the show that Rob connected with so emotionally were painted with encaustic, and its materiality impressed him. 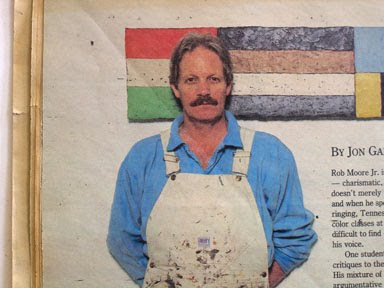 This is the connection I felt when I read about his reaction to the Johns show: he loved wax and paint as I do. But did he love color more? Rob's juxtaposition of color fields was deeply felt and conveyed emotional weight. He thoroughly understood the interaction of colors, but his understanding was based on perception rather than conception. 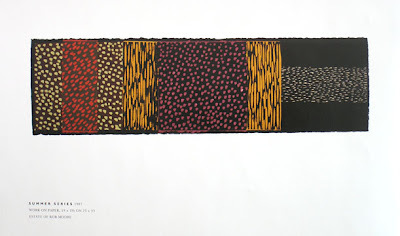 Untitled 1990, oil and wax on board, 28" x 84", collection of Nancy Talbot, from the catalog of the retrospective. "The works from the last couple of years of Moore's life are commanding, with a palette - purple, black gold - full of religious symbolism. A tall vertical from 1991 combines stripes of somber black and gray with an expansive midsection of purple. What rescues the painting from morbidness is that glinting through the waxen purple is a brilliant, glowing violet that reads like hope made tangible." 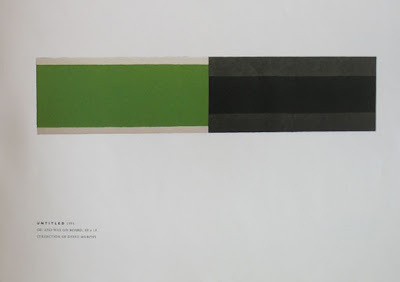 - Christine Temin, "MassArt's Rob Moore: A Life of Form and Color", a review of the retrospective. I had the above image in my picture file for Rob Moore with the title "Remembrance". I don't know where the image came from but I know it is Rob's work and the title is most apt. I hope that other students of Rob's will read this and comment about their memories of him. 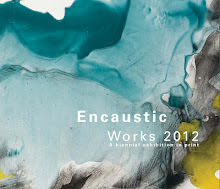 "What I want you to hold onto is your own faith in making an abstract painting - it's tough. It's a lonely business." - Rob Moore quoted by Jon Garelick in the catalog of the retrospective. OK, so I'm not a fan of winter. I only live in New England because I was born here and can't afford to get out right now. The snow and cold and whatever are so not me. 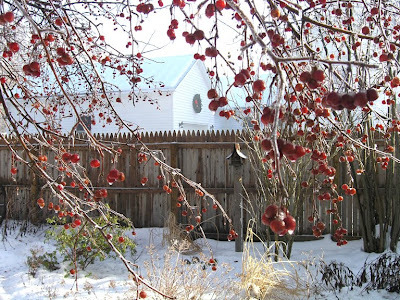 But sometimes I grudgingly admit that winter can be beautiful. Today was one of those days. On Sunday we had some snow and then rain. It froze overnight and coated everything with ice. Then this morning it warmed up and everything started to melt. 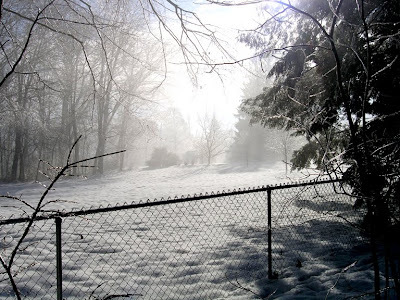 When I went out with the boys, it was a strange misty but icy world. 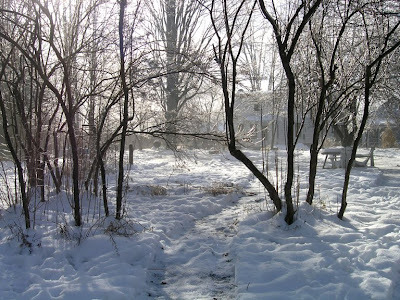 The trees were covered with melting ice and mist was rising up as the sun hit everything. I think it was that state between a liquid and a gas that is called sublime. A good word for it. 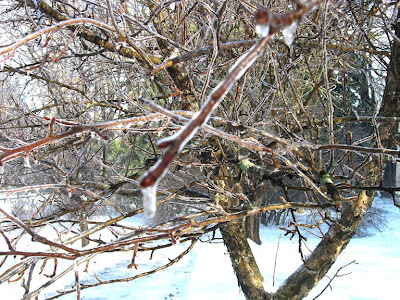 An ice drip close up on an apple tree. 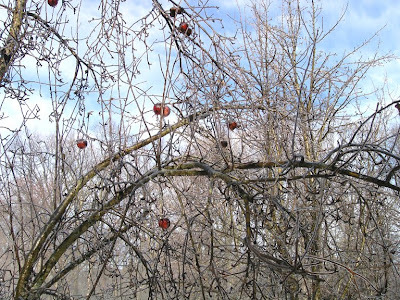 Leftover apples in a tree bent down with ice. 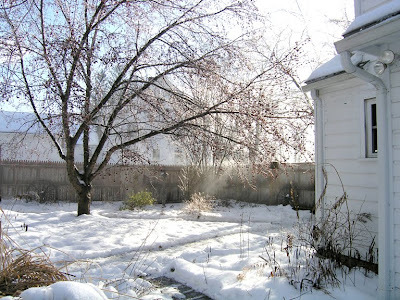 Mist in the neighbor's yard. I'm calling it mist but it wasn't coming down from the sky - it was rising up from the ground and the trees. 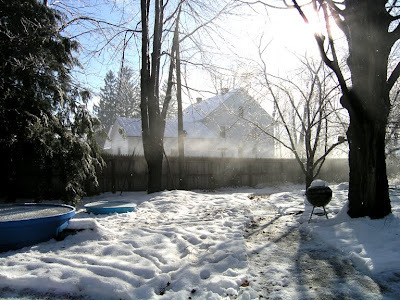 Mist rising up over the frozen dog pools and Webber grill. And it isn't even the solstice yet. 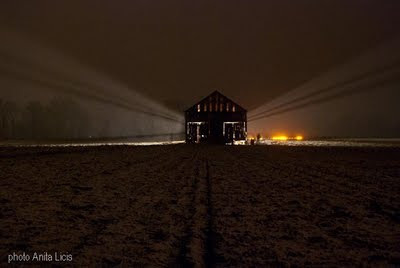 Afterwards, I thought we might investigate something I had seen in the Hampshire Daily Gazette about a tobacco barn in Amherst that was illuminated during the month of December as an art and sustainability project. I thought that would be a cool thing to see and I could photograph it for this blog. What I saw in the newspaper. What my photograph looked like - after being "improved" in Photoshop. What a professional photographer can do with the same scene (photo by Anita Licis from the Shedding Light blog). You can read about the project on the blog - quite interesting. 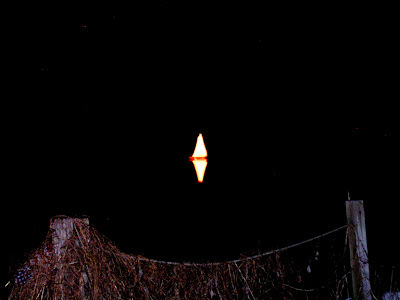 We were disappointed that the barn was not as bright as we had hoped, but we pressed on looking for more Christmas lights. 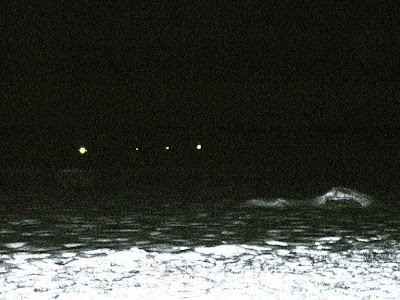 We knew about the tree on the Connecticut River from an article in the Gazette, and the photo by Jerrey Roberts that accompanied the story looked like this. Kinda looks like a sailboat on a mirror. 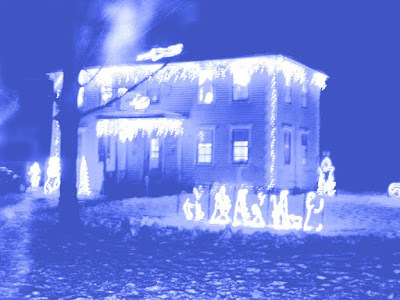 But I did know of one house in Hadley that had been very lit up last year, so we went there. My photography was less than stellar so I decided to turn it a color since I do enjoy blue lights and the blurring is less visible in blue. LoLo had graciously invited us back to her place for desert - chocolate lava cakes with French vanilla ice cream - and to see her photos of Spain. The desert was just fab and so were the photos. 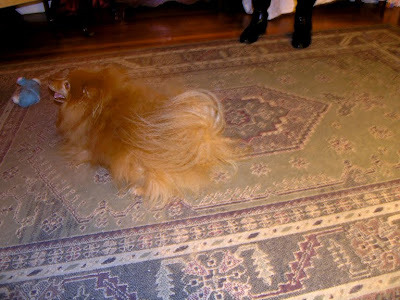 Her little Pomeranian Bongo did his hysterically funny dance for us. And this is what I captured. So I proved that I am not a photographer and I should leave it to the pros. 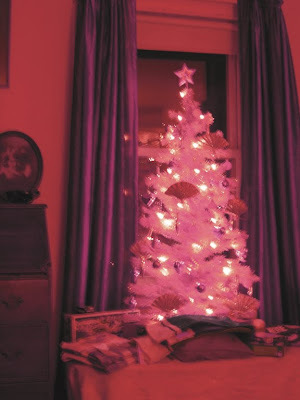 But here is a blurry image of LoLo's great Victorian pink tree. 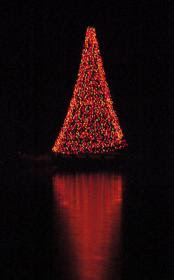 A lovely symbol of the season and of our festive evening on the town. 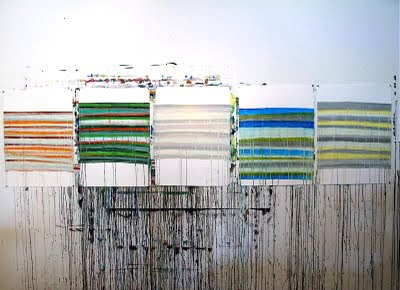 Wow, a great video of Philip Guson painting and talking about his work! This video is from the National Gallery via YouTube posted by Jeffrey Collins. (It says footage of Guston from Michael Blackwood.) I took it off Facebook courtesy of Tracey Physioc Brackett. It's fascinating to see him working so loosely. His paint handling is just fabulous. But even more important is his struggle to be true to himself and his ideas. Inspiration for Painting - Philip Guston and The Presence of Absence. I've been on the couch and at the computer but at least reading about other people's art, such as in Joanne Mattera's blog about the Miami art fairs, where she describes the scent of "Vert" permeating the air with the spring freshness of reborn optimism and the color of (hopeful) money. 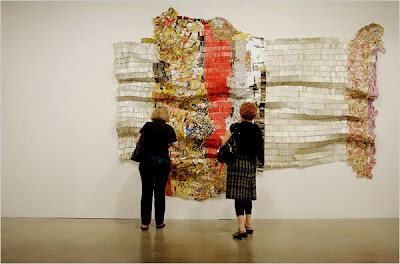 Then I read online in the NY Times a similar assessment of the same art goings-on in Miami with a slide show that included a photo of a stunning work (above) by my current favorite artist and inspiration, El Anatsui. (This piece is being shown at Jack Shainman's booth - or so the Times says.) I love the irregular shape of this piece that makes it more sculptural. Just great! - and probably better in person. 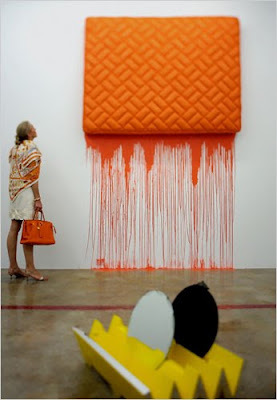 This is another piece from the slide show called "Tangerine Dream" by Jim Lambie. I liked it and it reminded me of a studio shot that Philadelphia art blogger Tim McFarlane posted a little while ago of some works on paper from his "Condensed Fields" series. Here is Tim's shot of five of his acrylic on paper works, each 30"x22". 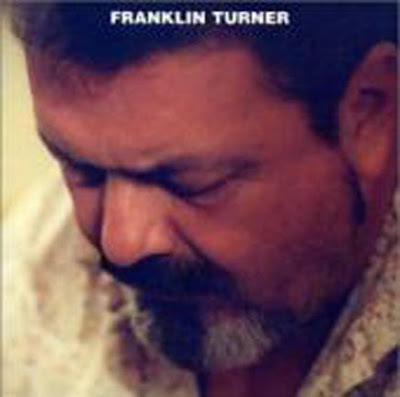 And finally, I was scrolling through Facebook (and what a time waster that is in general) when I came across a post from my niece, Nicole Turner, about her father and my brother, Franklin. He is a musician who has managed to live his life just by playing music, mainly on piano. He has a new MySpace page where you can listen to four tunes from his previous CD. My fave is "Every Time We Meet." When the new CD that he's working on now is finished, some of those tunes will become available. This is a big advance into the virtual realm for him, made possible by his son-in-law, Jeremy Geiger. So now off the computer and back to the studio to deal with the physical and the real, what a concept.